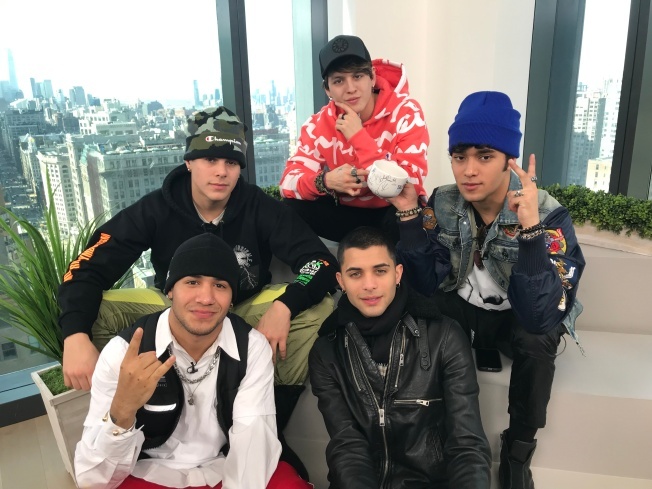 Win a Talk Stoop mug signed by CNCO! NO PURCHASE NECESSARY. Void where prohibited. Open only to legal U.S. residents who are 18+. Commencing on 04/04/19 at 12:00 AM Eastern Time and continuing through 04/08/19 at 12:00 AM Eastern Time, (“Sweepstakes Period”), LXTV Productions & NBC Universal Media, LLC (“Sponsors”) will award 1 Talk Stoop mug (“Prize”). During the Sweepstakes Period, entrants must (1) subscribe to the Talk Stoop YouTube channel and (2) Follow @TalkStoop on Instagram (“Entry”). Limit one (1) Entry per person. On or about 04/15/19 Sponsors will randomly select 1 winner (“Winner”) from among all valid Entries received during the Sweepstakes Period. Sponsors will make two (2) attempts to contact Winner by direct message to the Instagram account used to submit the Entry. Prize redeemable through 04/26/19. Prize is awarded “as is” with no warranty or guarantee, express or implied, by Sponsors. Sponsors’ decision cannot be appealed. Total Actual Retail Value of Prize is $19.95. By entering the sweepstakes, each entrant agrees to indemnify, and release and hold harmless, Sponsors, and their affiliated companies, from any liability that may occur from participation in the sweepstakes and/or use of Prize. All taxes and other expenses, costs, or fees associated with the acceptance and/or use of Prize are the sole responsibility of Winner. This sweepstakes is in no way sponsored, endorsed or administered by, or associated with, YouTube or Instagram. Entrants are providing information to Sponsors and not to YouTube or Instagram.